On the last day of Vancouver Fashion Week, I decided to take advantage of the beautiful weather and wear my favorite new spring skirt. I bought this while in Australia and I think it is just the cutest thing ever. It is by a brand called Here Comes The Sun and doesn't it just suit that name so perfectly? It is the perfect skirt to mix with other prints so I decided to go with some stripes on the top. Seriously one of the most simple ways to do a print on print and looks super cute every time! We caught the last few shows on the 5th day and it was such a great mix of international designs. 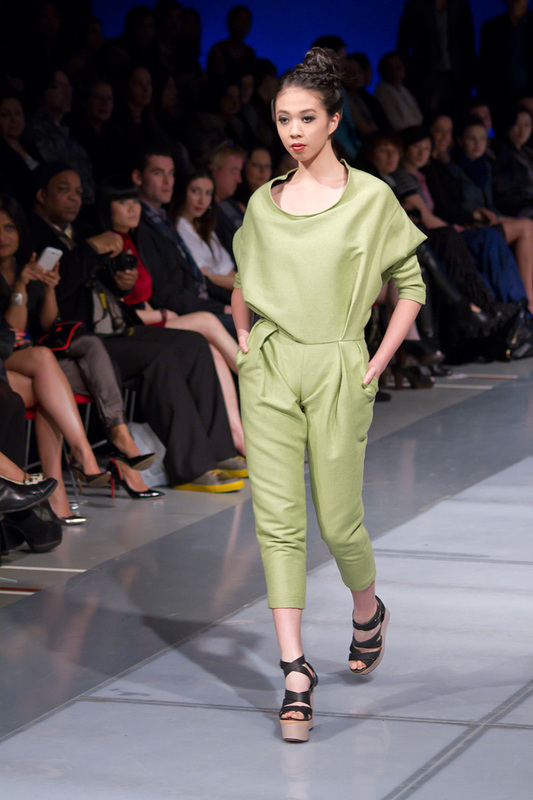 On this day we saw the shows of Green Black Dress, Laend Phuengkit, Well Groomed, Eva Chen, and Jaya Misra. We don't have any photos from Jaya Misra. but we do have plenty from the others! On this night, Eva Chen and Well Groomed definitely stole the show and I loved the Eco friendly simple designs by Green Black Dress. Check out the photos below! 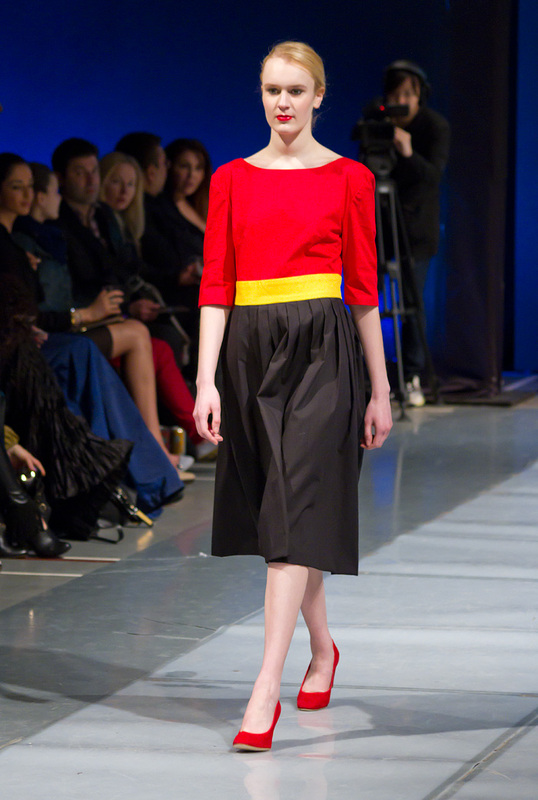 I always love a good Eco Fashion line! This designer had some of the most adorable, somewhat conservative dresses of the week. They were all very wearable and most would be very work appropriate, which is always a bonus. A great mix of leathers, prints and colours, this designer had the cutest jumpsuits and the best layering that I saw. I was actually quite surprised to not see more of this in other collections, but I appreciated this one for it. We live in Vancouver after all, and layering is an integral part to our dressing! Well Groomed really stole the show. Starting with a dance routine that was so much fun, the dresses were absolutely breathtaking. 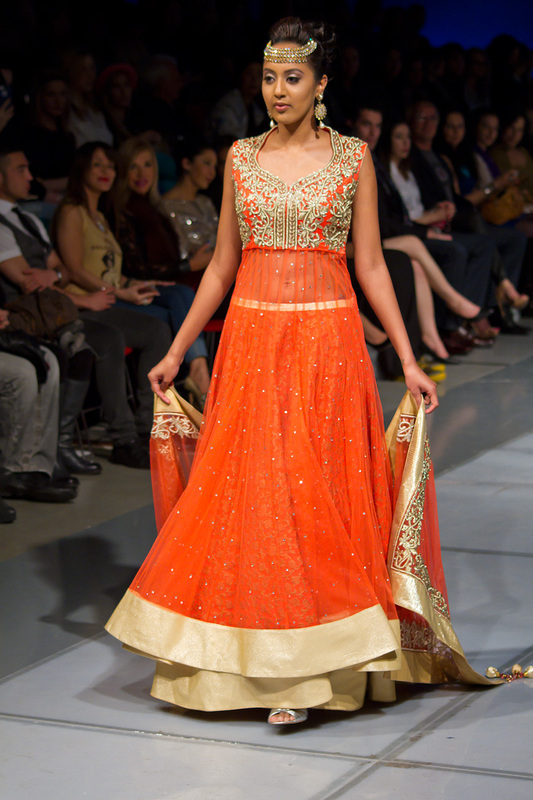 It made me wish that I had at least 5 Indian weddings to attend this summer. Everything was beautiful -- the fabrics, the colours, the sparkling rhinestones, the embroidery, and the models. Such a treat to the eye. Eva Chen had my favorite dress of the night -- the sheer black tulle midi-dress (pictured 3rd). I loved the fun details to make each piece unique and daring. You would definitely get noticed in an Eva Chen deisgn! 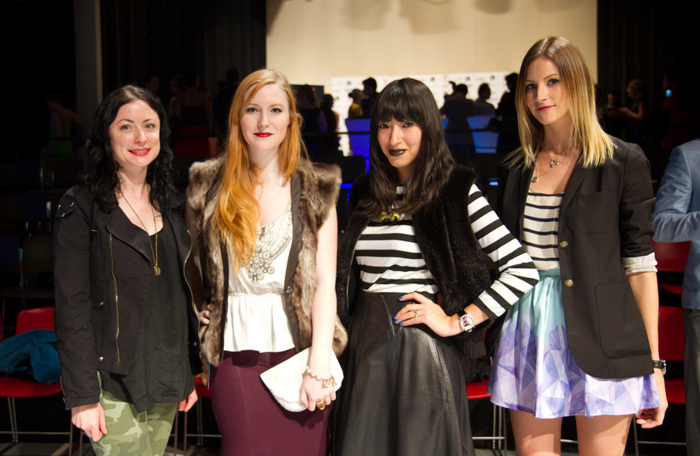 With bloggers Simone (Skinny Dip), Britta (Vancouver Vogue), and Nina (Nina on the Moon). Make sure to check out their blogs! From the collections above I loved Laend Phuengkit. The edgy looks are perfect for upcoming autumn season. hey there... u've got a gr8 blog.. want to follow eachother?? if so follow me and let me know i'll follow back for sure.. :) if can even follow eachother on lookbook,facebook and instagram. You look stunning, and I love your outfit. Specially that skirt. Beautiful print. Great collections and thank you so much for sharing. I LOVE the new skirt Alison. You look fantastic and love what you paired with it! Looks like so much fun at fashion week. love the stripes and skirt together. Looks fantastic!! !